John Tory? Olivia Chow? Doug Ford? Vote Compass generates an analysis of how your views compare to the positions of the candidates. Toronto voters head to the polls on Oct. 27. Try our Vote Compass tool to compare your views to the positions of the candidates. 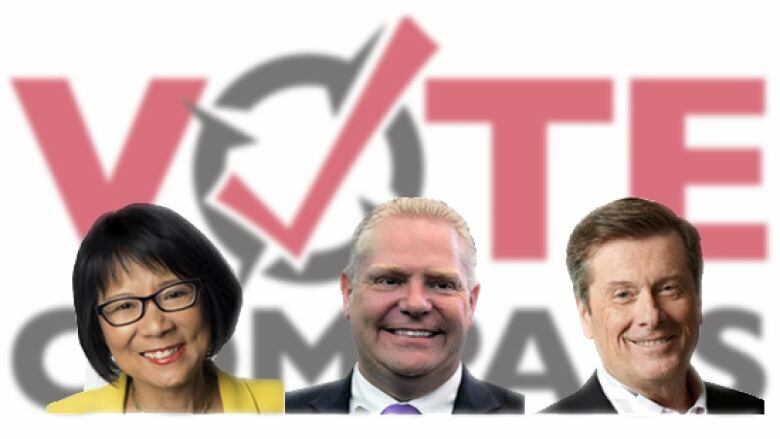 See how you fit into Toronto's political landscape by answering questions on specific issues included in the Vote Compass questionnaire. Vote Compass visualizes your results, and compares them with the positions and policies of the three front-running candidates. Once you know the results, you're free to decide which are most suitable for your purposes. A research team of political scientists analyzes the available data on candidate positions vis-à-vis the issues reflected in the questionnaire. Based on this analysis, a determination is made as to how each candidate would respond to each proposition. The research team then initiates a direct dialogue with each of the candidates represented in Vote Compass as an additional check as to the accuracy of its calibrations. All candidates are provided with an opportunity to review and, if necessary, challenge the calibrations before Vote Compass is launched. Clifton van der Linden, founder and director of Vox Pop Labs which created Vote Compass, said the tool allows voters to clarify the choices they face as the campaign unfolds. "Vote Compass helps citizens parse the rhetoric of election campaigns and get at the substantive public policy positions that differentiate the candidates," he said. "It offers an accessible way to move past the horse race dimension of election campaigns and engage in a meaningful discussion about the public policy proposals that will define how we are governed for the next several years. "It enables citizens to be more informed about the candidates’ positions on a range of public policy issues. An informed electorate is critical to a robust democracy. It attempts to make politicians more accountable by making their policies more transparent." The upcoming Toronto vote will be the first time Vote Compass has been used in a municipal election. Van der Linden said often the choices voters face are less clear in municipal races, something he believes Vote Compass can help address. "Given the absence of a party system at the municipal level, it is more onerous for citizens to make a determination as to what the candidates stand for and against in the municipal context," he said. He added that as the campaign progresses and more people participate, Vote Compass will highlight which issues are shaping the debate as voting day nears. "I am confident there will be no shortage of interesting findings to share over the course of the next several weeks," he said.